99 minutes worth of words. This equates to a staggering amount of inspiration and honesty and love that have flooded the internet in honour of Reid to celebrate his first birthday. And guess what? The emails and messages and posts keep coming. But it’s not just the quantity of participants that has us overwhelmed, it’s what these participants are sharing. To those of you who have and will contribute: you are amazing. You are all so brave and real and strong. It is an honour to witness you open up your hearts and spread your light across this world. Thank you for using Reid’s Reads to do it. So, dear readers, grab a cup of tea, curl up on the couch, and settle in for a liberating hour and a half. Oh, and if you don’t see your contribution here it might be because your profile is set to private (I’m missing about 40 from Instagram!). 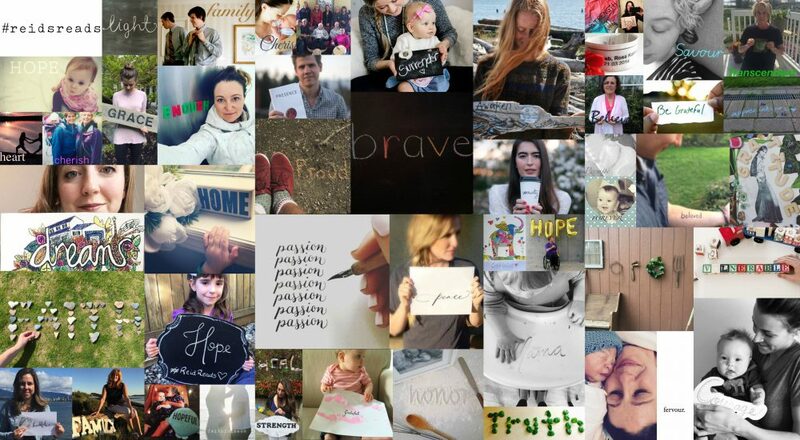 If you’d like us to share your word please send it to hello@emmahansen.ca. Son. I feel your presence. It surrounds me and it reminds me every day of the life that could have been. But more than that it reminds me of you, and it feels good to know that you are here, looking over your mom and I. Like the moon. Your moon. Whether it’s shining bright, or far off, giving light to someone else’s night, it continues to impact our world in a way that is essential to life as we know it, and so are you. Presence gets me up in the morning. The drive to make my own presence known in the world. To stop living in a land of ‘what ifs’, and ‘what should have beens’ and come back to reality. To the faces that I see in front of me. Experience them, and experience with them. Because if there is one thing I’ve learned, it’s that nothing is a sure thing, and we are not here forever. This isn’t as scary as it used to be, knowing you are on the other side. But it gives me determination to make my mark. To unplug and look up, to say yes now instead of tomorrow. To wake up from this routine, release my mind from auto pilot and build memories. Today, you are one. Today, you are celebrated beyond measure. Today, you are inspiring us all. On this day last year, under the blood red glow of that big full moon, I held you in my arms for the very first time. The room was quiet—no violent cries from you or from me, only silent tears that slid down my cheeks. Baby, I’ve never seen such perfection. That day was the greatest and worst of my life, and I’d live it all over again to have your heart beat one more time. On this day last year, I birthed you, my child, but it was also my own birth into motherhood. Oh, how being your mama has changed me—destroyed me in the most beautiful way. You have opened me up and altered my very core and you have done it with such fire and grace. You have sparked a flame for truthfulness and honesty inside me, one that’s quickly taken over and grown into the gift of veracity. Now, because of you, I’d rather show the world honest tears than a lie of a smile. I’d rather write stories laced with pain than happy ones that only narrate half the truth. When my own words fail me and grief has taken hold of my heart, I remember that during the some 53 million heartbeats we did get with you the words of Reid’s Reads prevailed. This is still true today, so nothing has changed, not really. You were born still but you were still born. So you are still loved. You are still growing. You are still Reid. Love you to the moon and back, baby boy. Your legacy is boundless in this world. Your life is endless in our hearts. Today we are remembering our beloved grandson Reid on the day he was born. My darling grandson Reid, today on the first anniversary of your birth I want to share with you my one word. You have gifted me with a deepened awareness and belief in “Family”. I feel your presence each and every day. You have strengthened and enriched Our Family, and you have expanded Our Family to the far reaches of this earthly world. I thank God for your beautiful pure soul. Till we meet again. A word that has empowered me through this year. A year ago today, my nephew Reid was welcomed into this world. Life works in unexpected ways and having to say goodbye to him was the hardest thing in the world. Reid has taught me to be strong in the toughest of times and love unconditionally. Although his time on this earth was far too short, his legacy will last forever. I was awaken exactly one year ago today. That full moon morning you were born sleeping, you woke me up. The first and last time I held you, you shocked me back to life in your stillness. Oh beautiful Reid, you have awakened the world. Your crazy aunty misses you so much. And oh how I wish you were here earth side today. I will continue to have dreams about the birthdays with you here, but I will always awaken with a fierce inspiration to live each day with you in my heart. To find you, all I have to do is look up to the moon. Beloved nephew Reid. You are greatly loved, dear to my heart. I see you take your first steps, run, and jump alongside kids that will one day truly call me uncle. I see you laugh, smile, and cry together with your cousins. Im glad for the glimpses I see of you, but yet feel so robbed. Every child in my life has become truly precious to me. I look forward to the day we truly meet. Till that day you are and always will BE LOVED. Today marks one year since I said both hello, and goodbye to you. I went to my favourite little park by my house and sat and thought of you, as I often do. There is no one word that can adequately capture for me how I feel; how your brief life has impacted mine; how your footprints have left a mark on my heart. Despite the tremendous void of you not being here, I am thankful! Thankful for your life and the great legacy you’ve left behind. Thankful for friends who are really more like family. Thankful for a deeper faith and a hope in the future and all it has to offer. Thankful for a God who is good and has only glorious plans. Honour. (or honor for all our friends in the US.). Honour their life. It seems so simple to me. Organic. Born of an innate need to remember our son and draw some greater life force from the brief time Bo was on this earth. To acknowledge that he matters. There is no greater way of showing love than honouring their life. For us, that means adventuring for Bo, talking about him openly and often. It means choosing life, seeing the light in lifes joyous and funny moments. It means holding each other tighter and loving that little bit extra. It means granting ourselves permission to feel the pain of Bo’s absence without shame. It means connecting with others in grief and letting them know ‘you’re not alone’. It means raising awareness. It means smiling at the world some days, and hiding from it another. It means looking out for yellow birds and gazing at the moon. It means letting his sister know him, and in turn marvelling as we watch her love for him grow. It means feeling hope. It means love…in all of its forms. He is us….family. We will always honour him. Grief is a skill – as loving well is a skill. I have had the privilege of witnessing you both nurture, cherish, practise and live your grief as a human skill over the past year as you love, grieve and re-member Reid. Thank you for your raw, heart-wrenching transparency shared with others. With much gratitude and love, Aunt Janeta. Today we stand in remembrance and awe of a spectacular life, even in it’s brevity. Exactly one year ago today, Reid was born, still. His heart had stopped beating before he arrived earthside yet through tragedy and sorrow, God has brought a renewed strength and hope, even through the darkest moments where birth, death, mourning and joy are all intertwined. Witnessing the way that Reid’s mother, Emma, has loved her boy with faithfulness, tenderness and authenticity, I am moved by the truth that every life matters, and when we are faithful to the call, God will use our story to impact thousands. Age is not a factor for God to use you. Even the smallest person can make the biggest impact! I happened upon Emma’s Instagram on April 5th 2015 late at night while lying in bed unable to sleep. My husband lay sleeping beside me while tears flooded my eyes and soaked my pillow. We were about to mark a year of trying to get pregnant and 7 months into fertility treatment when I found Emma’s account. As much as I wanted to push away this pain I was feeling for Emma and her husband I could not. Emma’s words and the image, knocked me off my feet and changed my personal world view, forever: For though Reid was born still, he was still born. In June last year we decided to try one more treatment cycle at the clinic. If it didn’t work, we were going to take a break for a few months and allow ourselves to refocus. On Fathers Day last June, for the first time ever, that pink line I forever obsessed over for what felt like eternity finally made an appearance and so began our new journey. Reid taught me to savour every moment of my pregnancy. Every bout of nausea, every ache and pain, every kick and hiccup, my growing belly, every new milestone. He taught me that things can change or be taken away in the blink of an eye and to truly savour every moment. He taught me to never take a single moment for granted. It’s because of Reid that my pregnancy was the most wonderful 9 months, even the not so wonderful times. Reid taught me that although our birth plan did not go as planned, in the slightest, that I needed to stop and savour the experience I was about to have to welcome our son, Beckett, into the world on March 11th because he was coming home to us, happy and healthy and no matter how he arrived the end result was having our son in our arms, to take home and to savour him. Today on Reid’s first birthday, I honour him for giving me this gift and thank you Emma for sharing your beautiful son’s far too short life with us. Because of you, I consciously savour every moment. Grateful that I get to wake up to and cherish our beautiful daughter every day.grateful that she is healthy..that she is happy..and grateful that she is ours. Watching your friend surrender her first born child to his Heavenly Father is a powerful thing. It changes you. It changed me. As Christian parents, we talk a lot about ‘surrendering our children to the Lord’, about how they are HIS kids and we entrust them to HIS care. We pray for them at bedtime and have them dedicated in church on Sunday morning; but there is no greater test to this belief than the day God calls your child home…for some, this comes sooner than others. For Emma and Aaron, this came on April 4, 2015, the day that their beloved son, Reid Richard Vandenbrink, was born still. Since that day, they have been surrendering their son, and they dreams they had for him, to the Lord, and pursuing HIS plan for Reid on earth. Emma and Aaron, you inspire me. Your unconditional love for your son, your dedication to his legacy, your trust in the Lord, and your hope for future set an example for all parents – whether their children reside in Heaven or on Earth. Reid, you and your parents have reminded me that Charlotte belongs to the Lord, and His plans for her are greater than my own. No amount of striving, planning, or reaching will ever give me complete authority over her life, or mine. I often feel trapped by my type A personality: by the need for control over my surroundings. You have given me the gift of freedom that comes from daily surrender of my life, my plans, my daughter, and my future to the One who had “every moment laid out before a single one had passed” (psalm 139:16). You remind me to treasure the small stuff, to take nothing for granted, and to be present in my own life and relationships. You have changed my life…and I am just one person. Your impact reaches so far beyond me. Though your feet haven’t walked this earth, God has great plans for you here, sweet boy. I love you very much and am celebrating you today. One whole year, 365 days. Today we honour and celebrate Reid Richard VandenBrink; the boy with the heart of a lion. My word for you, sweet boy, is: fearless. It literally means to be without fear, also commonly defined as “without cause to be afraid.” The phrase “do not be afraid” is written in the bible 365 times; that’s a daily reminder from God to live every day being fearless. Even in the absence of your physical presence every single one of these past 365 days, your presence has remained evident, always. Alongside your family, you, Reid, have taught me to be fearless every day. To be fearless in and with my faith, to be fearless in all of my relationships, to be fearless in my profession, and to be fearless with how I live my life. Just as it is written in Joshua 1:9 “Have I not commanded you? Be strong and courageous. Do not be afraid; do not be discouraged, for the LORD your God will be with you wherever you go.” It is true, God is with us always, just as we carry you in our hearts, always. Even though your time on Earth was brief, your legacy will not be. I have been following your story throughout the year. Your story resonated with me because my own son Reid, almost died during labour due to a complete placental abruption. It was extremely traumatic. It was a very close call, but he is here with us today. Why some babies are spared and others are not we will never know. When you got your doula training and attended your first birth, you (& Reid) gave me the courage to do the hard things and move on with life. This is the only way we will grow. I agreed to attend (and photograph) my first birth since my Reid was born. My friend just had her baby the other day and I’m glad I got that milestone under my belt. The second thing I took courage to do was we did respite foster care for a newborn baby for week. Foster care has always scared me because I am an extremely sensitive person and it would be heartbreaking to have to give the baby back. In this scenario, our friends are foster parents. They unexpectedly got a newborn baby when they already had a trip planned. I really wanted them to go on their trip so they could get away for a much needed break, so I looked after their baby until they got back. It ended up going really well. I still don’t think we will do fostering at this time because for one thing it was really hard on my kids when the baby went home, but I am super happy I got approved for respite fostering and I am grateful I will be able to help out foster families for short stints. Foster parents do extremely hard work and need a lot of support! So I am happy to be in this supportive role. My word is “courage”. Reid has inspired me to be courageous and do two scary things this year and I am excited to see what else this years brings. Blessings to you during this week as you take time to reflect on Reid. My word is ‘saudade’, which is a Portguese and Galician word that means a nostalgic longing to be near again to something or someone distant. Saudade is often described as “the love that remains” or “the love that stays” after someone is gone. Although Reid may not be with us Earth side, he definitely made his presence known today – a day where we expected rain & were blessed with so much warmth and sunshine. Reid has shown the world how one little boy can bring a community together and, during his brief life, has touched the lives of so many people around the world. There is so much love for Reid that remains, all that love is definitely here to stay – forever. Emma Hansen’s Reid was born sleeping one year ago. In his honour, she’s asked the people who have followed her journey to share a word today – “That thing that you were too afraid to proclaim, that you didn’t quite believe, that keeps you going every day. The word that has inspired you to focus on the good, the positive, the true. What motivates you to never give up?” I can’t imagine the pain of losing a baby who kicked and rolled, who had a name and a space and no expectations for anything but. Still, I have followed Emma’s path and watched as it has intermingled with my own, in a way. Loss is loss, as I have been told numerous times, and while I’ve been ‘fortunate’ to lose early pregnancies, not babies carried for months, some of those stinging feelings of grief and disappointment and anger seem like they’re one and the same no matter what stage you’re at. I tried to think of a ten-dollar word but the one that has been sticking in my mind is SHARE. Because if there has been one thing I have learned in my own past year of highs and lows, it is that sharing brings in the support needed to get through the rough parts. Sharing gives other people hope that they, too, can survive. Sharing lets you spread your burden out so it’s not just on your own shoulders. Sharing demolishes the taboos. Sharing works, even if you sometimes get uncalled-for advice, judgements, and misunderstanding, because on the other side of that, there’s the love and the uplifting and the friendship and the understanding. Nobody should lose their babies – not Emma, not me, not anyone – and I am pretty damn sure that given the choice we’d all choose a living child over the lessons we’ve learned through loss. But if you’re going through it anyway, there are some hopeful things to find. Share, even when it hurts. Even when it makes you feel painfully vulnerable. My thoughts today are with Emma and her family as they remember their precious boy Reid, born still one year ago. To honour Reid’s memory I’m participating in Reid’s Reads with a word that comes to mind when I think of Emma and all the Mamas I’ve met through Landon’s Legacy Retreat. I can only imagine that the longing for your child never leaves you. In the midst of my feeble effort to give comfort, the Mamas I’ve met have taught me so so much about love, and courage, and especially empathy. The book pictured is about a grown man who longs for ‘One More Day’ with his Mother who has passed away…it made me think of the longing the parents who have lost a child must have…AND it made me think of the incredible moment it will be when parent and child are reunited one day. What a beautiful reuinion that will be! To all my friends missing their Littles, you are thought of daily and prayed for always. Today in honour of Emma’s little boy, Reid, we come together and share Reid’s Reads. This little boy has inspired so many of us in so many ways, but as a new mom myself, the story of Reid has ignited a deeper meaning for the word: vulnerability. My ability and desire to be vulnerable has multiplied as I read Reid’s story over and over again and I think of the blessing my own two babes are to me. Our hearts have grown richer by them but at the same time more aware of the gift they are. Reid, you have made me more aware of what it is to be vulnerable, to feel the vulnerability my children bring out in my heart. Hope for strength in the hard, impossible times. Hope when things don’t seem right in our pregnancies and we think everything is fine (when its not). Hope that one day, hopefully, medicine will be able to detect unknown problems during pregnancy, ones that cause still births and extreme prematurity… like Reid and Bella, born at 25 weeks and a 138 days stay in NICU. Hope that moms and dads can endure and survive such pain. Hope that time heals and that pain turns into love, so much love… because we know it does. Dear Emma, today we think of Reid’s Legacy and how precious life is. Happy birthday Reid. For Dear Emma, my word: sagacity. My word in honour of Reid’s 1st Birthday is Fuerza, which is Spanish for Strength. As I was thinking of a word today in honour of Reid’s day, this word came to me on the side of a bus shelter in Chile, and reminded me of my own strength as a mama. I’ve been inspired by the strength Reid’s mama Emma has shown this year through through her honest words and vulnerability. In Honour of Reid’s 1st Birthday, we choose “FOREVER”. You have touched me by your mother’s words and raw emotions poured out for the world to find. I know she has reached many mothers, daughters, fathers, sons, aunts, uncles, and grandparents around the world with her love for you. Your brief time here has touched an untold number of hearts and continues to daily. Personally, I have been turning more towards my faith when I think of you, your family, and my own family that is no longer of this world. I have Faith that much like you’re watching over your parents and loved ones, my parents and loved ones are doing the same for me. The signs are all around, but I feel it most deeply when I see yellow butterflies, which has been a lot over the last few days. For Reid’s Reads my word is FAITH. Happy 1st Birthday in Heaven, Reid! Thank you for giving me a stronger Faith in God, and in the next chapter. Your family is often in my thoughts and prayers. Emma, we shared hallways in high school for four years, but otherwise we don’t really know each other. I followed your journey before Reid’s birth, and no words can describe how his legacy and your strength has moved me, and shaped me as a mother. It took me a few days to find the right word. But I think I’ve finally found it. It’s His promise that gives me purpose, calms my soul, and pushes me on. Even in darkness there is light. Reid is not here on earth now, but we will have eternity with him. I year ago my oldest son was diagnosed with Crohn’s disease at only 23 months…. My world shattered, my heart broke into a million pieces…. I told my husband that I was never going to be able to smile again…. I thought I did everything right: super healthy pregnancy and eating habits, yoga, the best vitamins, natural birth, breastfeeding for 20 months, etc etc….. And yet, they diagnosed him with something chronic and hard to manage that can affect so many aspects of his life. I cried myself to sleep so many nights and one day I stumbled upon your IG account and it changed the perspective I had on his diagnosis….. Reid has taught me to be grateful and enjoy him just how he is, to never let myself or anybody define him by his condition, and to ACCEPT it, to stop fighting his diagnosis and move forward…. Believe and have faith that God will help us find the best treatment for him with the least side effects and that he will be able to lead a normal and extraordinary life because he is the most extraordinary little boy. One year ago Reid came to our world still, but that didn’t stop him from having an impact on our hearts forever. Although we don’t always understand what God’s plan is for our lives and why we have to face challenges, we are comforted by his grace and love for us even in the hardest of times. This past year Emma, Aaron and their families have truly lived out what it means to be faithful. Although it might not always be pretty, as grief never is, they are truly living out Reid’s purpose! Their strength, love, faith, and perseverance is something to be admired. Peace isn’t something easily found in grief, but it is what keeps us going. The peace that our loved ones are safe and sound, so our hearts can rest. It helps remind us how precious life is and that we should live every moment to its fullest. My word for Reid: Moment. We had dreams for you and Lucy to grow up as 2 peas in a pod but everything changed in a moment. So much pain in a moment, so many dreams crushed in a moment, but who knew so much healing could be brought out of a moment. You are one loved boy and your legacy will and has changed lives. You are one loved boy and are missed everyday. About a year ago at 37 weeks pregnant I began to hear of the heartbreaking story of @emmahansen who’s first born son was still born, but born still. After seeing her blog post pop up in my Facebook feed several times and avoiding it for obvious reasons I said a prayer before diving into her words. I could hardly read let alone comprehend her beautiful, perfect post about his birth. It was so close to home, so raw as we waited for our baby. Saying yes to being a mother before they are even with us physically opens you to possibilities you never dreamed of. You are open to such lofty heights that seem as close to heaven you’ll ever be, and to valleys of despair you hope and pray you never come to. Emma, I’ve never met you, but I want you to know how much your story has impacted me. I think about you and Reid everyday. I think about how unfair life is, how it doesn’t make any sense what God asks of us sometimes. It’s been 1 year since my cousin Aaron and his wife Emma lost their son Reid on his due date. The word broken is a hard one. But a word that God has redeemed for us through Reid’s life and death. God chooses to break us to show the world himself- his light won’t shine as bright in perfection but in brokeness we get to see God in his fullness. We are pressed on every side by troubles, but we are not crushed. We are perplexed, but not driven to despair. We are hunted down, but never abandoned by God. We get knocked down, but we are not destroyed. Thanks Aaron, Emma and both families for choosing to share the story God has given you to tell. We have not been changed by perfection, but by real, raw, brokeness. This is my way of keeping my mind from having unhealthy thoughts. My life is a journey full of learning experiences. Because of the challenges I’ve gone through, I am more mature and wise. I am very grateful for the “negative” experiences because they’re so good at teaching me some of the most invaluable lessons in life. One time I was studying psychology with a friend of mine who is a medical student. We came across this term that has always been on mind ever since: “Sublimation.” The best way to understand the meaning of the word is to run a search of the word on Google Images. It basically means channeling the negative urges and impulses that one gets from facing life challenges into positive behaviour. I’m sure we’ve all heard the stories of the CEOs and athletes who grew up in very rough situations or had painful breakups that lead them to become very successful. Those people learned from the hardships that they went through and used that acquired knowledge to make better decisions in their lives. I try to find the lessons in the different life experiences that I have. If I find myself having thoughts like “what did I do to deserve this bad luck?” I take a step back and remind myself that this is a blessing in disguise. No matter how big the loss is or how hard I’m suffering, it’s a gift to me and I need to do my best to understand it. Asking “what do I need to learn from this?” is a much healthier way to look at life. Yesterday was the first birthday of a special baby boy who left the world too soon, like Ryan. His mom’s blog and Instagram were among the first that I stumbled upon in the early days of Ryan’s death. I reached out into the great expanse of the internet, grasping for something to give me hope. To make me feel less alone and isolated. In her words I saw pain and loss. But also hope and light. Her words are real. She speaks truth about loss and the love that still exists despite it. A truth I have always hoped to capture here. So when she posted that in celebration of her Reid’s first birthday, she wanted people to share one word that her boy has taught us about life and loss (Reid’s Reads), I knew I wanted to participate. I wanted it to be my way of showing her that her journey, and her baby boy, helped me find my way on my own journey with my own sweet baby boy. How to exist in this world without him here with me. Her family showed me that even though Ryan is not physically here anymore, he can still be included in every single part of our lives. He’s a photo and a candle by the tree on Christmas morning. A bouquet of flowers perfectly arranged in the living room. He’s a note in a card on a holiday. A stuffed bunny or dog under a tree in the cemetery. A necklace, a bracelet, adorning me in all moments, giving me courage when I “got back to life,” and still now everywhere I go. He’s a teddy bear who once snuggled Ryan in the hospital but now cuddles me on the couch. Who gets dressed up for a special occasion Ryan couldn’t be here for. He is included in all things. Because even in death, he still is so much to us. He’s everything. Inclusion stretches further than to just us including him in our lives. It means surrounding myself with people who include and acknowledge him too. He’s real. He’s a part of me. And on my journey, it’s been so important for me to be around people who include him too. Who send a note saying he crossed their mind. Who share photos of butterflies and the letter R and say they were visited by him. Who visit with him. Who light a candle, make a donation, say a prayer in the name of our baby boy. All I ask, is that you let me know. Knowing he is as included in your life, as he is in ours, is the greatest gift. On Reid’s first birthday, I am reminded that we’re not alone in this journey. Not alone in the lows. Not alone in the highs. Ryan is there. Our friends and family are there. And this community we’ve found, beginning with Reid’s mom, is there. Hope; remembering Reid today with you. Mamma, your strength and courage has reminded me that even in difficulty and great sorrow there is hope. I want to acknowledge that I grieve with you, my husband and I found out today from the Olive Clinic that we are sadly miscarrying our first baby. I found this cloud has been hovering over my house all day today. I just finished standing outside, I found comfort as I noticed although this cloud brought a gentle rain, and the bright sun still continues to shine. Today, I hope with you that with this journey towards parenthood even in the deepest sorrows the sun still shines on us and it will over power any dark cloud. To my very dear and wonderful friend….. I can only hope for you and your family that the ferocious storm you have weathered this year will now settle into a calming ripple. Giving you the peace and joy that you so deserve. Beautifully written. My word I choose is “ANGEL”…. Perspective. That’s my one word for Reid’s Reads today, in memory of my nephews 1 year birthday. Perspective is what my family, Emma, Aaron, Amanda, Rick, Alana, and Rebecca has shown me. You can let a tragedy can define you in all its negativity, or you can take that beautiful silver lining and let it turn your perspective into a positive one. One that makes you stronger, one that makes you grow, one you learn from and one you can take away more from than you ever imagined when first hit with the blow. I am thinking about Reid, you and Aaron today. The word that comes to mind when I think of Reid is that he is cherished by his Family and all your friends. Sometimes in our busy lives we lose sight of what is really important. Reid taught me how important it is to love and cherish those closest to us everyday. I’m sending you my word by e-mail as I’m not on Instagram (my old fashioned laptop allows me to look at your account but can’t download the app to follow or react). I’ve been thinking about it for a day or 2 because “love” is also my theme word for this year and I wanted to find something more specific for Reid. But I kept coming back to “love”: the generality of this concept “love” is also its strength. At the time Reid was born, I myself was recovering from a massive burn-out and heartbreak, both having built up over more than a year. My personal crash came in December 2014, and I am grateful for it. It was a big emergency shut down from my body, mind and soul, saying “stop! take care of yourself!” after I had been ignoring physical and mental warning signs for a long time. Since the beginning I started to love myself fiercely. I don’t know how else to put it, but when I look back, that’s what it was. Automatically, I started to listen AND take into account how I felt. Over the last 1.5 years, my feelings (my sixth sense, my heart, … LOVE) have been my compass to navigate through life again, and it’s better than before because I stay true to what my body and mind want and need. I took a sabbatical and read a lot, getting infused with inspiring people and stories. I stumbled upon your IG by ordering leggings from PranaVidaStyle… Amelia’s story = love, your story= love. Everywhere I’ve been looking, I can see love behind everything. You two to conceive Reid = love. Reid’s 9 months and the interaction you 3 had = love. The inbearable strength to let Reid go, to hand him over to a greater force, “take care of him till we can see him again” = love. Being so open to life without Reid here, even making the very very best of him, in his memory, for his future brothers or sisters = love. I’m amazed and nurtured to see all that on my silly laptop screen… I can feel your love all the way to Belgium. And in turn, like some weird mathematics law, it multiplies. I become even more aware of love around me and in me: acting on it and reacting to it is becoming my second nature. It feels and seems like love is the flow on which the world thrives. As for my own life up till now: my body is really healthy again, I’m in the middle of starting up my own bussiness, and very unexpectedly I met an awesome guy 2 weeks ago who (although it’s still early days) seems to love an respect me just as I am. As for you 2 and your kid up in heaven: lots of LOVE! Before your birth one year ago, I had very little idea of the staggering facts and figures related to stillborn births, miscarriages, and infertility. Of course I knew they existed, but it wasn’t until your birth that my eyes had been opened to the concept that these tragic events happen more commonly than I though. Had your mama not let your story shine, I would have continued my naive mindset. I thank your mama for sharing your story so that people like me can learn the sometimes distressing outcomes of the fragile lives we are graced with. This is why I chose the word truth. It is through your legacy that I now know the truth; people can’t hide the facts that stillbirths, miscarriages, infertility, etc. happen. In the years to come, I will keep you in my mind and remember the truth you have shared with me. Thank you Reid. Just wanted to reach out to you today. I have been thinking about Reid lots this week. I was pregnant with my son when you met yours. My word is mama, Mama- with every perfect imperfection of mamahood I am a mama. Once you become a mama, you will always be a mama. Motherhood is so full of extreme highs and extreme lows. And it sounds like this past year You have experienced all the highs and lows of motherhood- I know very differently, but they were still there for you. You got to know your boy over this past year, and he has changed your life just as much as my boy has changed mine. It’s a funny thing social media. We often times see only the perfection in mothering our babes, as you know,motherhood is less than perfect and I applaud you for sharing with us your experience with the highs and lows of motherhood. This is my word, love. Because Reid has taught and inspired me to love all things around me, and continue loving even with all the things that come in the way. Thank you for sharing your story Emma, because it has taught me more than love. It has taught me about having hope, staying strong, accepting the negatives but also embracing the positives and the future that lies ahead and so, so many more. Happy birthday Reid. Thank you for teaching me everything that you have. All Reid has known in his life is love, and it will always be love. Thank you Emma, for sharing your story and being so strong. Happy birthday Reid, and thanks again. I prefer to keep my account private however I admire your story and account so much so I thought I would still share a source of my inspiration in remembrance of Reid. I try to live my life as humble as I can and I admire how much more people can connect with each other when we do allow ourselves to be humble. I remember it clearly, the first time I read the story of Reid’s passing. Sitting in the library on a sunny April day, I opened your blog as a break from my studies and began reading. Truthfully, I couldn’t have told you what was going on while I read. Your words painted a beautifully heart aching story. I promptly left the library and went for a run to digest what I had just read. As a ran, my thoughts wondered. I couldn’t even begin to understand the sorrow you must have been feeling. That summer, I had the immense opportunity to finish my nursing degree off, by completing my preceptorship in paediatric oncology. Your stories, and journey of grief and love were close to my heart as I worked with incredible families and kids struggling to comprehend their journey ahead of them. I frequently found myself wondering how to act, struggling to find the right words to say to parents following a new diagnoses or working with palliative kids. Reflecting on your stories of navigating grief, I found myself feeling more comfortable with families, and just allowing myself to be in the moment with each family and just being present for what ever they needed me for. I feel deep gratitude that every day families open their hearts to allow me to be a part of their journey in the hospital. Parents surrender themselves and their children to treatment plans and protocols to give their children a fighting chance to survive, and the fact that they let us into their lives to join their journey is an immense honour. Not a day goes by that I don’t think about the difference I can make with theses families and strive to be someone who can positively impact their day, with a smile, a touch or even just sharing silence. This deep gratitude comes back to you, Emma. Families like yours who open their hearts to others, and show the raw reality of life following lose. You are an incredible inspiration not only to families, but to all of us who get the opportunity to work with those families. So thank you, for being you. For sharing the truth and reality of grief, and the fierce love for your incredible son who continues to inspire me to be the best I can. When I think of you and your sisters it brings back memories of our childhood and of how simple life used to be. This year I have often felt nostalgic for our summers spent on the “Party Rock,” where our only worries were if we had enough Pringles to last the entire day and what time the water would come up and force us to dry land. But now, as I know you are aware, life is oh so different. Life pulls us in different directions, life gives us joys and also unimaginable sorrow. Sometimes life is like the tide coming to wash away our carefully built sand castles, it ebbs and flows and as much as we wish we could, we cannot control the tides. When I found out you were expecting a child, I was so thrilled for you! My sister and I chatted on numerous occasions about how jealous we were that you looked so amazing pregnant and we speculated that those beautiful genes of yours would be passed down to your baby boy. [We were right by the way, your boy is the most beautiful baby we have ever seen.] I was looking forward to watching from a far as your little munchkin grew up. I had visions of him running around Gossip Island in cute little suspenders causing mischief and of course winning 1st place for biggest fish at the annual fishing derby someday. But we cannot control the tides and sometimes they come crashing in. Your story has touched me so deeply my friend and your son has taught me so much in just one year. I have learned that childhood friends may drift apart, but they still hold a special place in your heart. I learned to love more deeply and always tell the ones you care about how you feel. But most importantly, your precious boy, Reid, has taught me the word Relinquish. It is a word that is unsettling and uncomfortable, because it is human nature to try to control all aspects of our lives. I am type A all the way. I live to make plans, to dream, to make lists and follow the rules. Life, however, is just like a rolling tide. No matter how hard we try to control the outcomes and carefully write out our to-do lists, sometimes life sweeps you up in it’s changing currents and pulls you in a new direction. We cannot control the tides. So this year Reid has taught me that sometimes it is important to relinquish control, let go of expectations, and tackle life as it comes. I do not know you personally and how I came across your IG account Emma, I do not know, but in retrospect I can only say, “it was providence”. Thank you for sharing with such eloquence and honesty the beautiful legacy of your most precious son Reid. Thank you for putting into words what so many (too many) of us parents have gone through in silence. Happy 1st Birthday in heaven Reid! Em, my word for #reidsreads is Compassion – the response to the suffering of others that motivates a desire to help. Even though Reid’s presence here earth-side was ever so short, the impact of how he has connected a community of people this year is everlasting. Strangers and loved ones are coming together for you and your family – to grieve, to remember, to honour, to celebrate and most importantly, to love. The love that I and so many others have for you, Aaron and Reid is immeasurable. This loving community will always be with you on this journey of life after loss – as will I. I’m wanting to wish the happiest of birthdays to an incredibly special boy. Auntie Lacey loves and misses you dearly. Hey guys, just wanted to let you know that I love you. Wish I could have been there tonight to celebrate Reid’s birthday with the families. My word is Hope. A parable in the book of Mark that stood out to me is that of the mustard seed when Jesus is responding to a question about what Heaven is like. Although the context isn’t exactly on point, the idea that the smallest of all garden seeds can become one of the largest of all garden plants, exemplifies the impact Reid’s life is having on so many people. Such a small human being, and such a short time with us, he’s having a greater impact than we could ever have imagined. Happy birthday to your very special baby boy Reid. I have followed you for a long time on Instagram (I found you because we had the same wonderful wedding photographer) and your posts always captured my attention. I had been struggling to get pregnant for a few years when you made the announcement that you were expecting. I remember thinking longingly that it just seemed so easy for everyone else. I watched your updates with a twang of jealousy and a hope that someday that could be me. Amazingly I became pregnant myself 4 months after you shared your news. I continued to follow your journey through pregnancy with joy and watched as a sign of things I could expect down the road myself. I waited eagerly for the news of your little Reid’s arrival. When you shared that he was born still, my heart broke for you. I spent many nights of my pregnancy thinking about Reid and you and how brave and strong you were for sharing your life and his so publicly, and how unfair life is that his had to be so short. I also gained a new outlook on everything. I relished being pregnant before, but Reid taught me to appreciate everything, always. Every pain, every sleepless night, everything was a gift. Your baby boy has changed my outlook on so much and has taught me to be grateful for everything because nothing is guaranteed. His life has made a huge impact on mine- and I’m sure on many many others that you don’t even know. I know I don’t know you, but I thought since Reid has given me so much, that today, on his birthday, I should share with you how much he has impacted me. Your baby boy is beautiful and he will always be a source of inspiration to me. And so will you. I don’t know how it feels to lose your first born baby who had kicked you, grown with you and lived with you for 40 weeks- but I did lose my first pregnancy very early. And I have struggled with fertility for many years so I can understand a bit of what you’re facing now. From what you are sharing it looks like you are already doing it, but just keep hope. I hope to hear good news from you soon. LOVE is the word that fills our heart. When we think of our year and our connection with your beautiful son, Reid, we are reminded of how fortunate all of us are to be able to love and be loved. We have loved you Emma since you were five, together with your wonderful sisters, Alana and Rebecca and your devoted parents, Rick and Amanda. We loved when we witnessed your love for Aaron on your wedding day and your love for your first son, Reid. Reid has brought you the opportunity to experience motheryl love, the deepest of all loves. We are thinking and praying for you on the first anniversary of Reid’s birth and passing. We feel a deep love for you and Aaron and the love that Reid has brought to you, your family and many friends. Emma and her husband Aaron are celebrating Reid’s birthday today. This card talks about a connectedness to a higher power, and reflecting on our life lessons. I see you doing this, and want you to know that by writing and sharing authentically the way you have – you have also opened doors for other people to do the same. Your healing is truly helping others. I mostly just want to say that I am honoured to be a witness to your love for Reid and your drive to build an amazing legacy around his precious life. Offering my support and love for the amazing couple that is Emma and Aaron today. Today we are thinking of Reid and the impact he has had on our family. Miss you Reid. Today we celebrate a sweet little angel, on what should be his first birthday. Happy first heavenly birthday Reid. I’m honoured to light Aedan’s candle for your precious little boy Emma. I’m sure all our babes are celebrating Reid’s birthday in style. It’s amazing to me how much “Love” Reid has brought to the world. When I think of the lives he has touched through his birth and amazing parents. Their hearts have ached with such sadness and sorrow but Reid’s birth has also shown them so much love! My word is ‘Love’…Happy birthday Reid!! I only hope you know how many people all over the world love you!! This is my word, or I guess – my phrase. It’s been a constant reminder since I first had my body marked with the words I prayed over myself after one of the worst years of my own life. I’ve been praying this for you, and over you, for the past year. I know what it’s like to be all consumed by grief. I remember the days of wondering what the light even feels like, when all around you there is only darkness. But you learn to fight for the light, don’t you? There is something bittersweet about learning to live in the present, that not everything or everyone is permanent. It’s beautiful because it changes the way we see, think, perceive, and feel about the world. However, it’s also tragic because of what we have often had to face to get to that realization. Your story over the past year has empowered so many women, men, mothers, fathers, sisters, brothers, aunts, uncles, and me. It’s in the darkest moments where I’ve learned to find the light. To fight for the light. To hold onto and seize any ounce of light I can find and treasure it like it’s the most precious gift. That’s because it is. Thank you for sharing your story, and your journey, in finding your light. Lots of love from Vickie and the Eagle Feather ladies class. Happy Birthday, handsome, precious Reid. You are always in my heart, sweet child. I’m sure my girl has found you up in heaven and given you a little birthday kiss. My word is “appreciate”. I have learned through your tragic loss and your inspirational words that you can’t take anything for granted. I need to recognize the full worth of everything I do and what other people do. I need to be appreciative of the small things like every sunset, every hug, every time I laugh. These small things make me so happy and you have reminded me to appreciate that moment when I get to experience them. Reid and your story truly taught me to trust in the Lord. I read your story and felt from your words how broken, hurt, and sad you were with Reid’s passing but what affected me the most is how faithful and strong you are. I discovered your blog last year, shortly after Reid’s birth, and it amazes me how I found you at a time where I needed to connect with God again. It was at a time when I was upset with what I was (and still) going through and questioned why God chose me for the path He set forth for me. I was upset for you. I didn’t understand why God chose Reid so soon and that you were going through all this hurt and a truly heartbreaking experience, which doesn’t compare to mine at all, and you turned to your faith and trusted in the Lord. And here you are today, I am truly amazed at how much Reid had touched so many people around the world and is still teaching others so many wonderful and inspiring things through your story. Reid taught me we can’t control everything that happens in life for reasons beyond our understanding and just as I am reminded of one of my favourite verses, we need to trust in the Lord with all our hearts and not lean on our own understanding. It’s not for us to know the answer to “why” God chose Reid to be with Him at that time and why other things happen in our life the way God intends for them to, because He knows the plans He has for us. We sometimes don’t know our purpose in life but I know that I learned so much from Reid and you. You both helped me connect with God again and turn to Him instead of being upset and angry at my circumstance. I don’t believe it was a coincidence that I found your story. I think Reid wanted me to find you and I hope you have comfort in knowing that. Happy heavenly birthday to your sweet boy! Both you and Aaron have demonstrated it since the day Reid came into this world. Thinking of you and your family. I think of you and your family often and especially this week. I am so grateful for your honesty and willingness to share what this journey has been like for you and forever grateful to have met you and Reid. and OK my word is FOREVER! Because Reid reminded me again that I love Isaac forever, even though he passed almost 22 years ago. I think I told you that I was the same age as you were when Reid died. Time ticks on but that love, mumma and papa love, is timeless,it’s forever. Also, the memories and grief are forever and that’s hard and comforting at the same time. This photo was taken at a midwifery conference in Eugene a few months before he died. Isaac cheerfully came along to so many conferences, workshops and even births. Together we welcomed many new babies earth side. That’s something I’ll remember FOREVER. Thankfully, for most of us, the kind of fresh grief that debilitates, doesn’t last forever. But loss changes you forever. For better and worse. I catch glimpses of my old self, the ‘before’ me, in my peripheral vision all the time and I mourn her forever, too. But losing Isaac, as Reid reminded me, has also made me forever more humble, deeper and grateful for what I do get to have and keep in this life. I was shown 2 days before Isaac died, that the soul lives forever but I know I won’t have to wait forever to see him again. Emma and Aaron, I have never met you. A year ago today I heard the news. I was at a family birthday party and I went and hid in their bathroom and wept for you both. So as I prepared to photograph my “word”, my bathroom felt like the best place to be. And again, I wept. Loss stops you in your tracks. It causes (and forces) you to pause in an all too busy world and reassess. To stop and smell the roses, feel the moment and take stock. God has blessed me. He has blessed me with 4 children to hold here on earth, and before that with 2 more I will have to wait to hold in heaven. Having children to hold here on earth will never replace the ones I can’t. Every life is precious, however brief. Lessons to learn, love to give and opportunities to grow. Thank you Emma, Aaron and Reid for sharing your story and giving a voice to a narrative which can be painful to speak of. I have prayed for your both many times this past year and will continue to do so. One year ago, my dear friend Emma said hello and goodbye to her firstborn son. Reid was born still, but he was still born. My word for Reid’s Reads is fervour. Early in our pregnancies, Emma and I made plans (what we do best). We would have our babies. I would move to Vancouver. Our days would be filled with playdates and walks along the seawall, children in tow. We soon discovered there was a rare, high-risk complication with my pregnancy. The death of my baby was a real possibility. I slowly waded through fear and anxiety, grasping for divine peace. Emma and I kept in touch throughout my four weeks in the hospital as I awaited my scheduled C-section. Her optimism and confidence encouraged my weary soul. “Everything will be okay,” she promised. Then life took an unimaginably cruel turn. Aaron & Emma lost their son. The day before his little body entered this world, his precious soul entered eternity. I was filled with deep grief and the most profound sympathy. Emma courageously delivered Reid on April 4, 2015. I am so proud of her. Aaron, Emma and Reid filled my thoughts and prayers. I understood the anticipation and expectation of pregnancy. I could only imagine the agony and gut wrenching pain of loss. In the midst of mourning, David and I prepared to welcome our firstborn. One week after Reid passed away, Grace arrived safely. This photo captures the moment I met my daughter. The moment my prenatal fear melted away. The first milestone I desperately wished Emma and Reid could have also experienced. After this photo was taken, David went with Grace to the Neonatal Intensive Care Unit. Left alone in the recovery room, waves of emotion washed over me. Joy. Fear. Relief. Anger. Indignation. Gratitude. Why is Grace here? Why is Reid gone? One year later, Emma and I are neighbours. We grab coffees and walk along the seawall. We laugh and we cry. It is hard to watch Grace grow up without her buddy, Reid. But in the midst of the pain, it is a privilege to journey with Emma & Aaron as they navigate grief and cling to hope. Their open hearts and honest words continue to inspire, comfort and encourage many. Because of Reid, I live with more fervour. Friendship is more genuine. Love for my daughter is more fierce. Faith in the hope of salvation is more crucial. Emma, I found you shortly after you gave birth to Reid and I am so thankful that I follow you. Reading all of your posts inspire me to be a better mother and they inspire me to be honest and humble. Jesus is my word because He is the word that comes to my mind when I’ve hit rock bottom, when I’ve had a rough day, when I’ve cried all my tears. He is always waiting for me when the world has shut me out and left me lonely. Many emotions come to the fore when the first year of any serious loss or calamity comes around. In subsequent years the pain is somewhat eased, or replaced, or viewed in a different way. It can be that someone does not want to let go, or maybe cannot let go, or find some comfort in their situation, which is the opposite possibility of surrendering and accepting. I believe in “accepting” as far as old age is concerned, and its consequential difficulties. There is no alternative of choice of what comes ones way. Personally, we can look back on a good life, with uncountable benefits, for which we are thankful. What we will have to go through before our end comes, no one knows. We do feel the first heartaches and pains of this already. I believe this pain can be eased when we accept the reality of our situation. We intent to make the best of the possibilities that we have. – Great Opa Kobes. I loved reading through all the #reidreads post and mentally composed this over the last few days, but am just now passing it on to you. I think reading some of the words from others gave me courage to write this down too. You and Aaron are amazing parents and I’ve been so encouraged your openness and strength and seeing Christ through you guys. This is the word that I couldn’t shake when thinking of what I’ve learned from Reid, his journey, and your journey. Reid has helped me grow in becoming fearless. In the last year I’ve reflected on how in my type A, controlling nature results in making many decisions from a place of fear, from a place of “what if?” Some of this is likely a result of what’s been my own experience with life and loss. Within the first year after my husband and I were married in we buried my husband’s brother after a very rough go with advanced cancer at a young age. It was a hectic time of newlywed life combined with a first year of grad school for me, and a new job for my husband in addition to having to move out of our first home together within a month after the burial. I don’t meant to share this to compare suffering, or to say how hard things were. I merely share this to offer context for what I learned through Reid. I think as a result of seeing how fragile life can be my faith life and prayers began to come from a place of fear. I would beg God (and still do) to keep my loved ones safe, and healthy. As if my prayers could be my security plan, so that I could still be in control. Reid showed me that in my own life again that things won’t go the way I want them to. That there are always going to be things out of my control, and things I can’t “fix.” I recently heard a sermon where the phrase “Do not fear” was mentioned. The pastor shared how Jesus is saying this as a command (I wish I could remember which verse was being discussed specifically, but I think Mark 5:36 is similar). Then he asked how many times in the Bible do we hear phrases like “do not fear” or “fear not” or “do not be afraid”? It hit me that Jesus says things like this a lot! And he’s commanding us to believe, to trust, and to NOT FEAR! It was so helpful for me to see how the way I was living my faith and prayers was not what God wanted for me. By fearing what my next suffering my be, or what hardships may come I was depriving myself of the Joy of all the things I have been given right now. I was missing out on the fullness of prayer and faith that comes from a place of gratitude in all things.